I always save making the fussiest cookies for last; the ones that are time consuming to make but would not be Christmas without them. 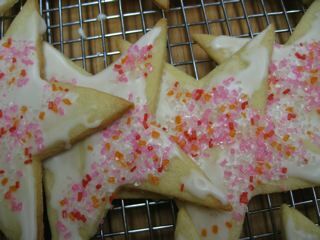 Sugar cookie cut outs are the last of the cookies on our 12 Baking Days of Cookies. This vanilla scented sugar cookie dough is easy to work with once chilled. And you can double the recipe. This recipe will make at least 3 dozen; all depends on how thin you roll the dough and the size cutters you use. I frost the cookies and let the frosting “dry” well before freezing them in layers in plastic containers. I hope you have enjoyed the selection of cookies for the holidays. I guess now I can put my feet up! Cream the butter and sugar well in a mixer until it is light colored. Beat in the eggs one at a time, then the vanilla. In a bowl combine the flour, baking powder and salt and mix well. Slowly blend into the butter mixture. Beat on high for 1 minute. Scrape the dough onto a sheet of wax paper. Wrap in the paper and refrigerate at least 2 hours or overnight. When ready to use, divide the dough into quarters and roll one quarter at a time between two sheets of floured wax paper or parchment paper. Remove the top sheet of paper and use your favorite cutters to cut out holiday shapes. Place the cut outs on parchment lined baking sheets. Or lightly butter baking sheets. Space the cookies an inch apart and bake them for about 12 -15 minutes, switching the sheets as they bake; do not let then brown. They should remain pale but cooked. Allow the cookies to cool on the baking sheets for 5 minutes then transfer to a cooling rack. 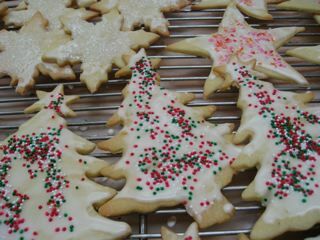 Frost the cookies with your favorite icing; allow to dry thoroughly. Freeze in layers between sheets of wax paper in plastic containers. Looking at these pics reminds me of when I was younger, my mom and us kids would bake for what seemed like days. We made all different christmas shapes and then we would decorate all of them and give away platters as gifts. Your blog always brings back these memories and I love it. Thank you! Hmmm. So I made this recipe and followed to the T. The dough is hard as a rock (and set over night) and then I tried rolling it out and it crumbles...what may I have done? Dan, that recipe has been in my family for eons; the only thing I can think of is that you used too much flour, or the eggs were too small. I hate to tell you to make them again because they are time consuming but sooooo delicious. Try spooning the flour (I used King Arthur all purpose) lightly into your measuring cup, do not pack it in. That could have been the problem. I so want you to like them because they are fab! I think maybe there was a bit more flour, i will try the spooning method though next time. Actually, I was able to fix it by kneading it with wet hands, it worked out perfectly! And after that, got the perfect shapes AND they tasted amazing! I am definitely keeping this recipe around, and will spoon gently rather tan dumping lol. Thanks again!